Two photographs of the old Chicago, Rock Island & Pacific Railroad depot in Alta Vista, Kansas. The first photograph shows an exterior view of the depot. 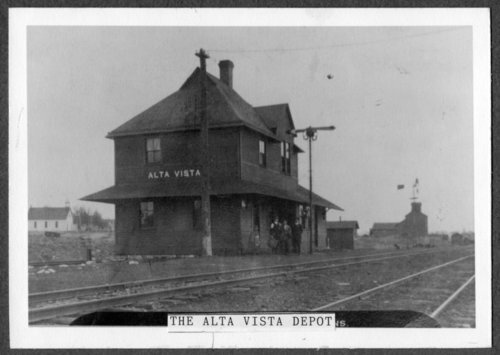 This was the first CRIP depot constructed at Alta Vista, built even before the rails were laid in 1887. This was one of the two-story depots which the railroad used in rural areas. Often the depot agent and their family would live upstairs. The second photograph shows five men posing inside the depot. In addition to providing freight and passenger services, the depots also contained the telegraph offices.